Wednesday, December 13, 2017, 17:30-19:30. Please come to a vernissage at the Osler Library to celebrate the opening of our newest exhibit. RSVP required. To RSVP please click here. Trace, late 14th century, “to make a plan or diagram”, from Old French, 12th century, trasser “delineate, score, trace, follow, pursue”. Materia Medica is an exhibition of recent work by Montreal artist Loren Williams. Invited by the Osler Library of the History of Medicine to create a body of work on the theme of Montreal’s medical history, and recipient of the Michele Larose – Osler Library Artist-in-Residence Programme for 2017, the artist combines artifacts from the Osler collection with collected and created traces of Montreal’s medical past. 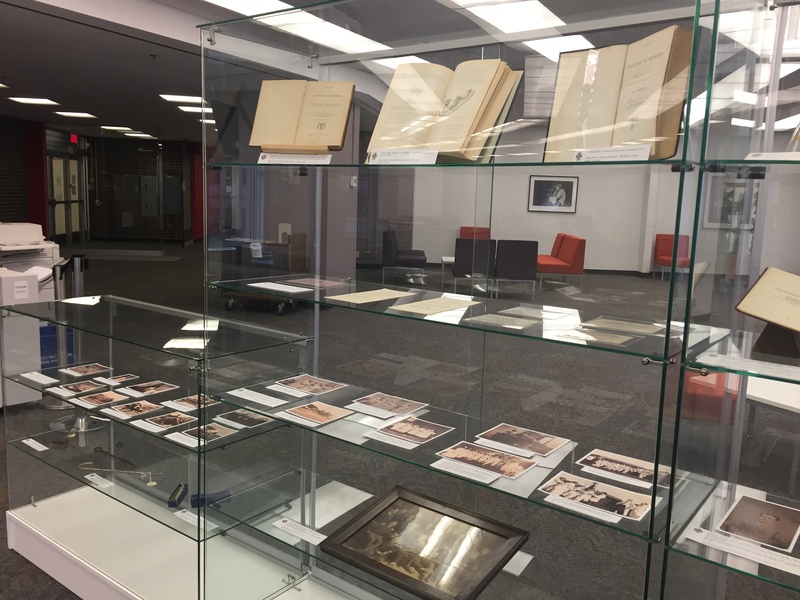 The work in this exhibition draws inspiration from books and artifacts in the Osler Library as well as a wide variety of other sources. In particular, early maps of the city offer a form of time travel, indicating the location of the first hospitals and their large gardens used for food and medicinal plants. Three hundred year old streets such as rue de l’Hopital and rue des Soeurs Grises still exist in Montreal today, drawing direct lines to Montreal’s medical history, as do streets named Jeanne Mance, Marguerite d’Youville and Penfield. Interested in these traces that reference Montreal’s medical heritage, Loren Williams has created a body of images that form a shadow archive. Images of medicinal plants used by the First Peoples and early settlers in Montreal were created using a 19th century camera-less photographic process called Cyanotype. 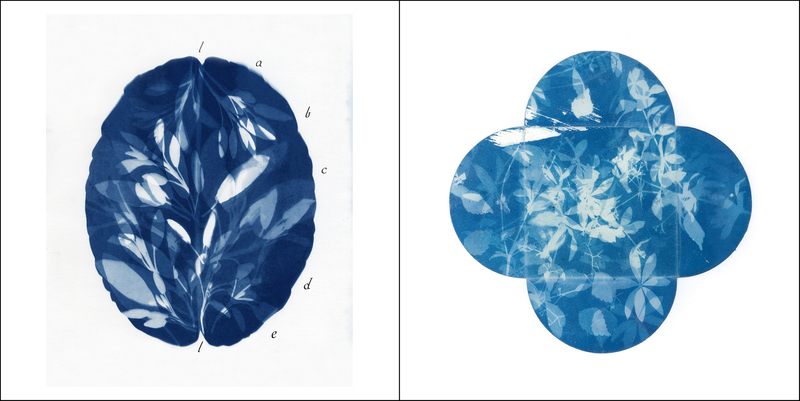 The blue coloured images reveal the shadowy forms and details of the plants. They are like paper X-rays, made from a simple photographic process that uses UV rays, ie. sunlight, to expose the image, and water to develop it, sun and water­­ being the same basic ingredients required by plants. Over the course of a year, the artist followed charted streets and routes that link Montreal’s past and present. Using epidemiological maps, she explored the sites and neighbourhoods of the city’s devastating outbreaks of Typhus, Cholera, Small Pox and Tuberculosis. Other plans of the city led her to sites of hospitals, asylums and the longest duel in Canadian history over the building of a new hospital. Like the collected plants that echo an early botanical pharmacy, Loren Williams also collected and created other traces of medical history. X-rays and teeth molds reveal the body’s structures, fractures and medical interventions. First aid kits and their compartments double as garden plans for medicinal plants, while hospital architecture is represented in the form of postcards the shape of library index cards. 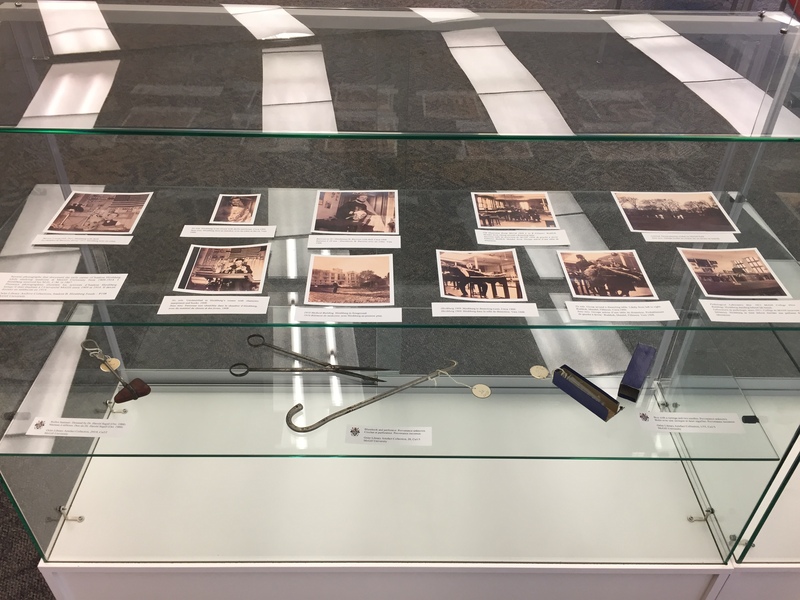 These works, presented with artifacts from the Osler Library collection, bring together images and objects from the realm of science, art and everyday life, offering an eclectic, less rational, interconnected perspective of Montreal’s medical history. Loren Williams is a visual artist working predominantly in photography. The passage of time, natural history, museums and obsolete photographic technologies are the inspiration and vocabulary of her practice. Frequently there is a connection between the artwork and the site where it is presented. Originally from the Kootenays in British Columbia, Loren Williams moved to Montreal in 1993 and received her BFA honours in photography at Concordia University. She has received awards and grants from the federal and provincial art councils and has exhibited her work nationally. Loren Williams extends much gratitude to Michele Larose, the Osler Library for the History of Medicine, and the Canada Council for the Arts for their generous contribution to this residency and exhibition project. Congratulations to this year’s Pam and Rolando Del Maestro William Osler Medical Students’ Essay Award winners! The essays are now available on our website. This year saw a tie for first place: Clare Forgarty for the essay “Sanitation, Sanity, and (Moral) Suitability: The History of the Medical Inadmissibility of Immigrants into Canada (1840s-1950s)” and André Lametti for the essay “Ars uero longa: Teaching Hippocrates in Medieval Italy”. 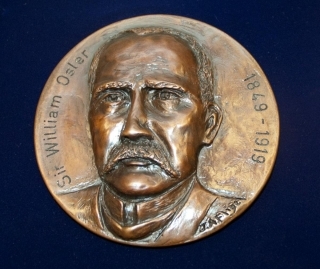 They were presented with their Osler Library Board of Curators’ medals during the Osler Banquet hosted by the McGill Osler Society on November 1st. Second place was awarded to Philippe-Antoine Bilodeau for the essay “A Tale of Two Brains: Cortical Localization and the Neuron Doctrine in the 19th and 20th Century”. Philippe-Antoine presented his paper via Skype while doing his rural family medicine rotation in South Africa. Thank you so much to all the students, mentors, judges, and sponsors who supported the contest. We look forward to next year’s presentations. Please join the library on this year’s Osler Day, Wednesday, November 1st, for a presentation of essays by the three finalists chosen as part of the Pam and Rolando Del Maestro William Osler Medical Students Essay Awards. The presentations will be held at 11:30 a.m in the Wellcome Camera of the Osler Library, McIntyre Medical Building, 3rd Floor. The winner will be announced at the Osler Banquet. Faculty, students, and friends are all welcome to attend and show their support for this year’s finalists. 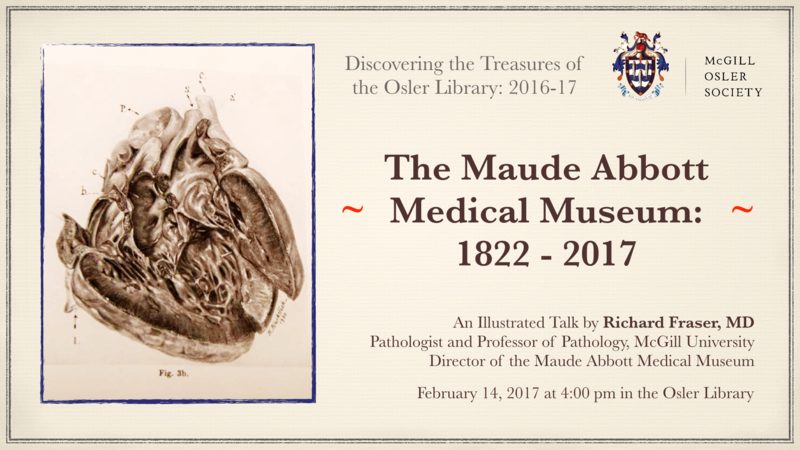 Our special thanks to Pam and Rolando Del Maestro, the Medical Students’ Osler Society, and the Board of Curators of the Osler Library. Thursday, October 12, 2017, 17:30-19:00. Please come to a vernissage at the Osler Library to celebrate the opening of our newest exhibit. During the 2016-2017 academic year, Dr. Lucy Lyons spent time in the Osler Library archives studying the illustrations made by the English physician and medical writer, Robert Hooper. Inspired by Hooper’s method of cutting out parts of his drawings like the analogue version of Photoshop, Lyons created her own fantastic collaged composites. 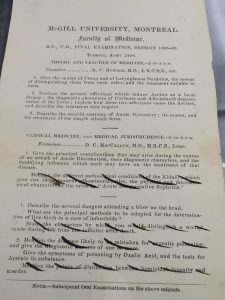 This composite method was then transferred into studies of the collections in the Maude Abbott Medical Museum to create new, impossible pathologies. This exhibition is an exploration of the beauty of the fragment which is synonymous with pathology. If pathology is the fractured, broken, diseased, deformed fragment of the human body, this work explores the further fracturing, breaking and then re-assembling of parts. Dr. Lucy Lyons received her PhD from Sheffield Hallam University. 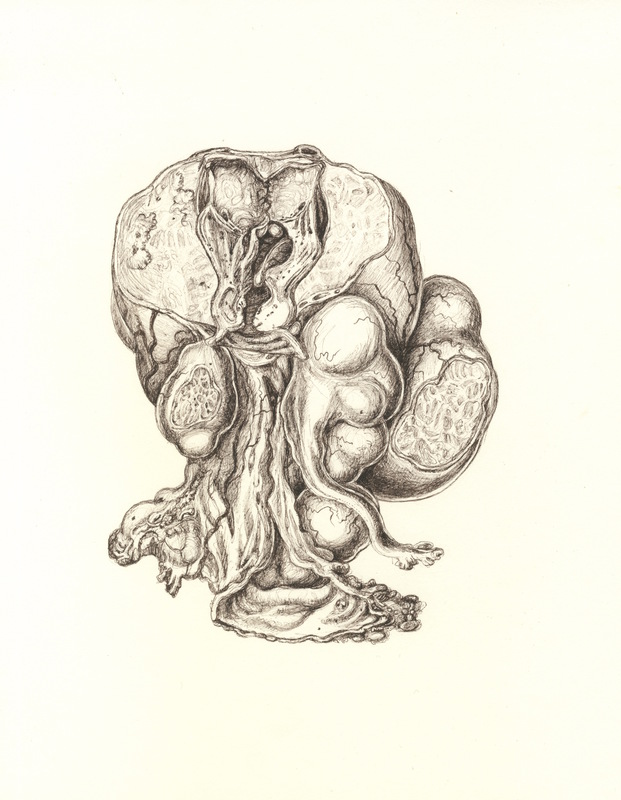 Her practice focuses on drawing within medical museums and working collaboratively to explore the beauty of collections. She is especially interested in the hidden, the overlooked, insignificant or in-between. This residency will allow her to push and explore her own practice and develop work in new ways whilst bringing new audiences to the collections. The Michele Larose – Osler Library Artist-in-Residence award, is given annually to one or more deserving candidates with a degree in Studio Arts or a related field and/or a history of exhibiting artistic work in professional venues. 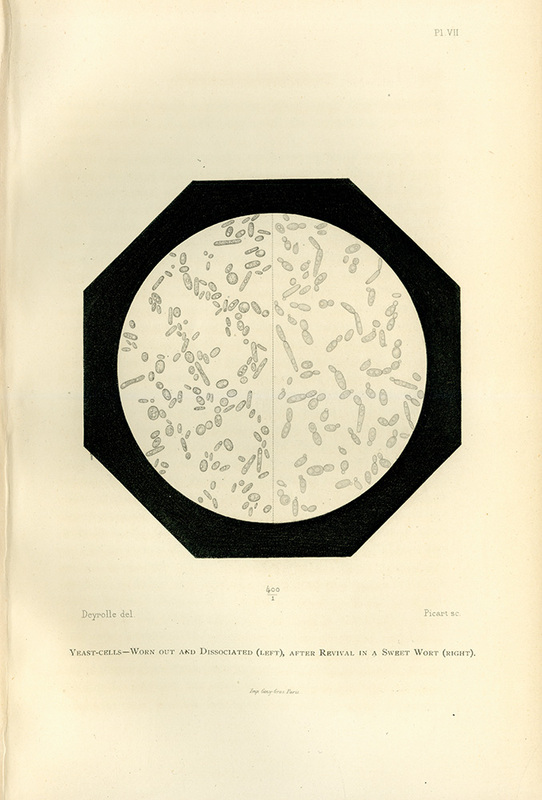 Illustration showing what healthy and worn-out yeast cells look like when viewed through a microscope. Illustration from Pasteur’s Études sur la Bière (Studies on Beer), 1876. 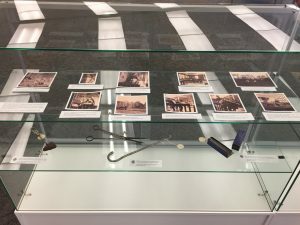 Vernissage: Friday, September 29, 6–8 pm at the Osler Library of the History of Medicine. Welcome to “The Gendered Cultures of Beer and Cheese: the Regulation of Human and Microbial Bodies on the Home and Industrial Scales.” This exhibition, comprised of medical texts, cookbooks, training manuals, and industry documents, showcases the ways in which advice about best fermentation practices has changed over time. As you visit the exhibition, we hope you will consider the following questions: How is the language employed around ideas of public health, food, and alcohol production gendered and classed? Are ideas about “what is safe” and “what is dangerous” regarding fermentation practices restricted to scientific understanding? To what degree are these ideas socially embedded concepts? The materials for this exhibit come from McGill University’s Osler Library of the History of Medicine; Rare Books and Special Collections; the Schulich Library of Physical Sciences, Life Sciences, and Engineering; the MacDonald Campus Library; the Blackader-Lauterman Collection of Architecture and Art; and the private collection of Alex Ketchum. This exhibit has been made possible by the generous support of McGill University’s Faculty of Medicine; the Institute of Gender, Sexuality, and Feminist Studies; the Department of History and Classical Studies; the Department of English; and the Office of the Vice Principal’s Research and Innovation Grant. We are pleased to offer this exhibit as part of this fall’s conference, “Leavening the Conversation: Food, Feminism, and Fermentation.” The event will be taking place on McGill’s campus from September 29 to October 1st. In addition to the above sponsors, the larger event is also sponsored by Le Réseau québécois en études féministes of L’Université du Québec à Montréal, Concordia University’s Department of Sociology and Anthropology, Concordia University’s Centre for Sensory Studies, and the University of Alabama’s Department of Gender and Race Studies. 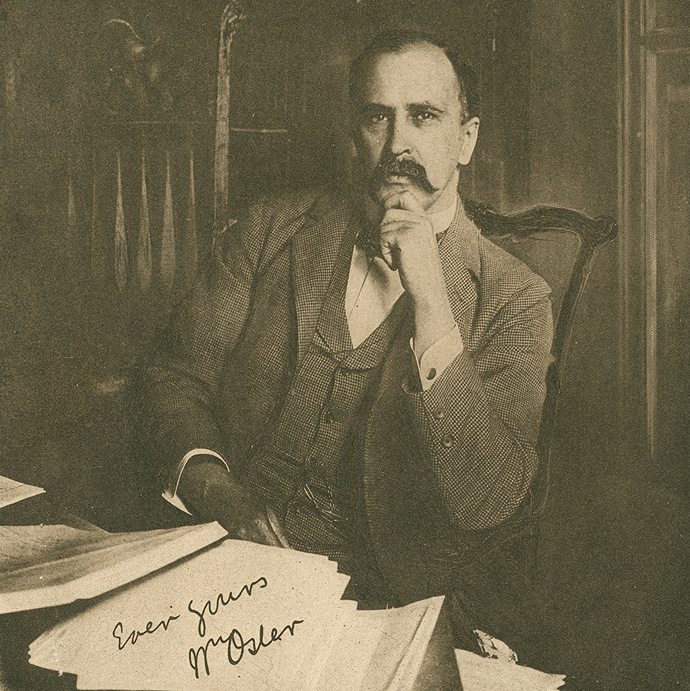 For Osler Library of the History of Medicine’s opening hours, please click here. McGill campus is gearing up for Science Literacy Week 2016, happening all through next week September 19-25th. 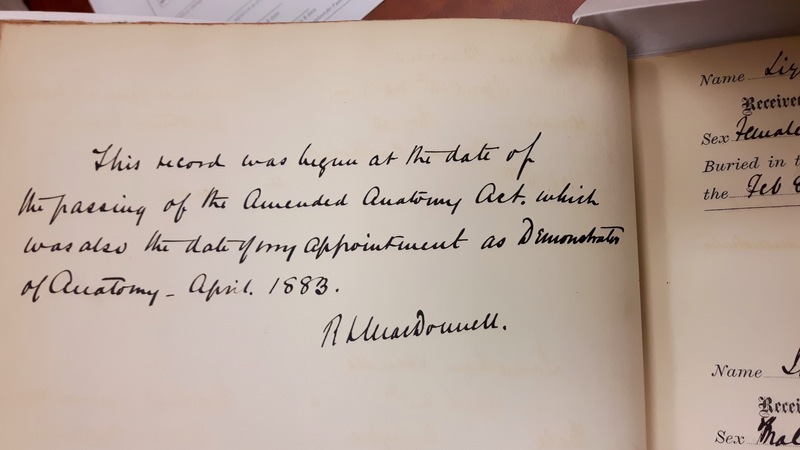 The Osler Library will host a special guided tour of Knowing Blood: Medical Observations, Fluid Meanings with curators Darren N. Wagner and Nick Whitfield on Monday, Septemebr 19th @ 11:30am. Registration is not required, but feel free to sign up to let us know you are coming. For more details and a full listing of next week’s events click here! Think you’ve got a busy schedule this semester? 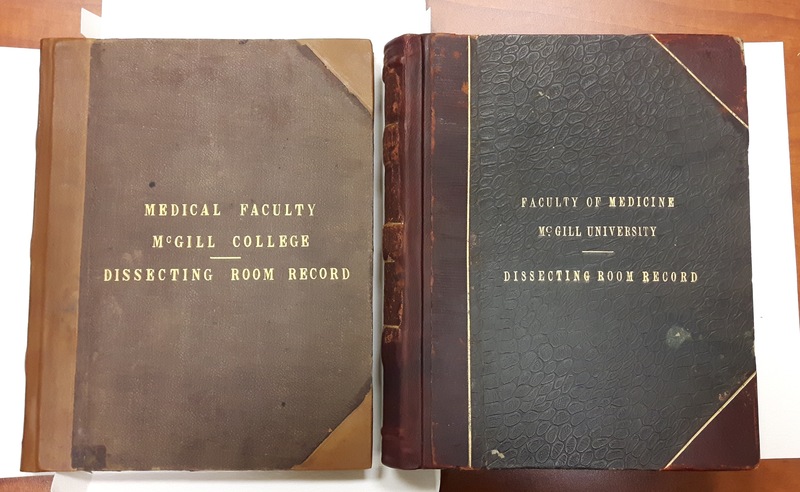 Here’s what Winter Session 1878-1879 looked like for McGill’s Faculty of Medicine. 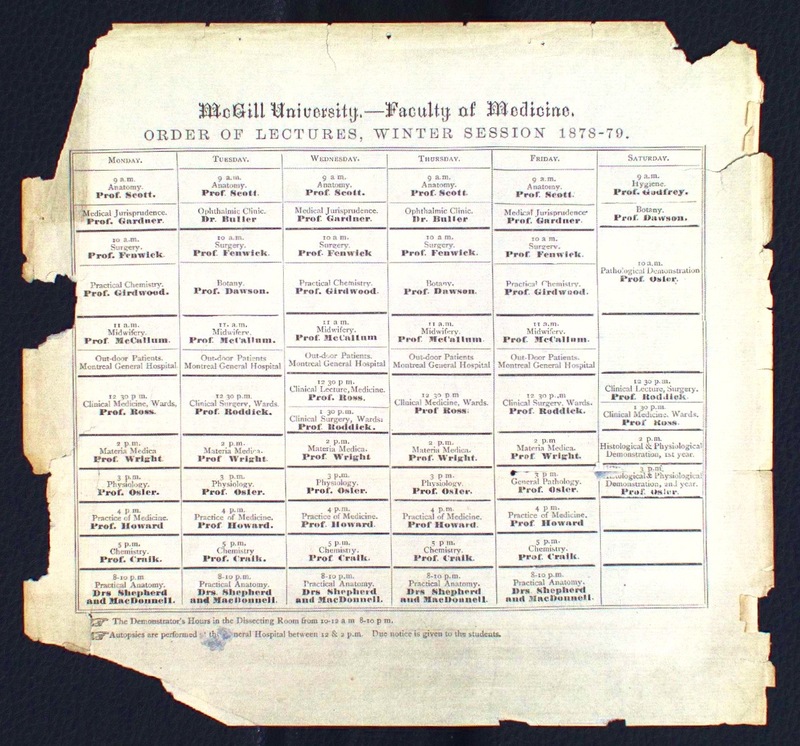 The course schedule shown below belonged to Sir William Osler – Professor of Physiology, General Pathology, Histological & Physiological Demonstration (1st and 2nd year) and Pathological Demonstration that year. 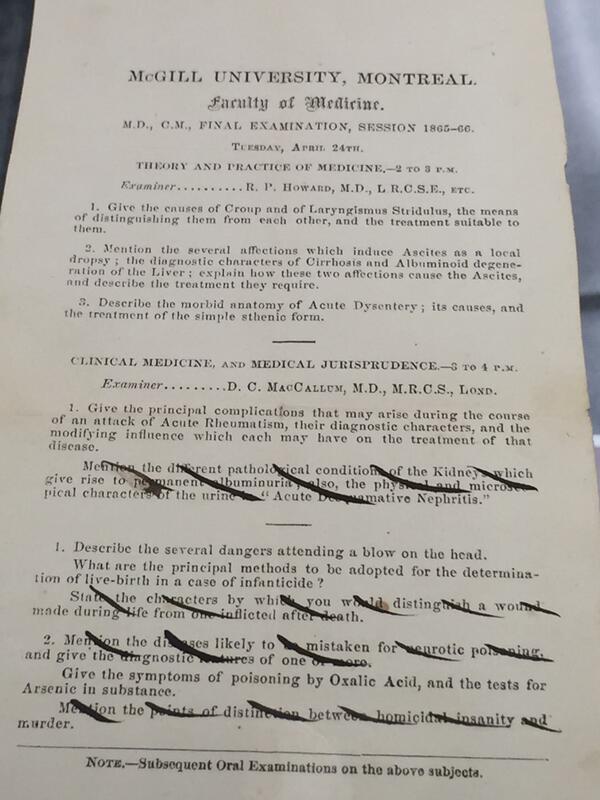 This historical piece of mcgilliana is part of our P100 collection – a collection that recently received a handful of new acquisitions generously donated from an Osler family relative (more on these new acquisitions coming soon!). 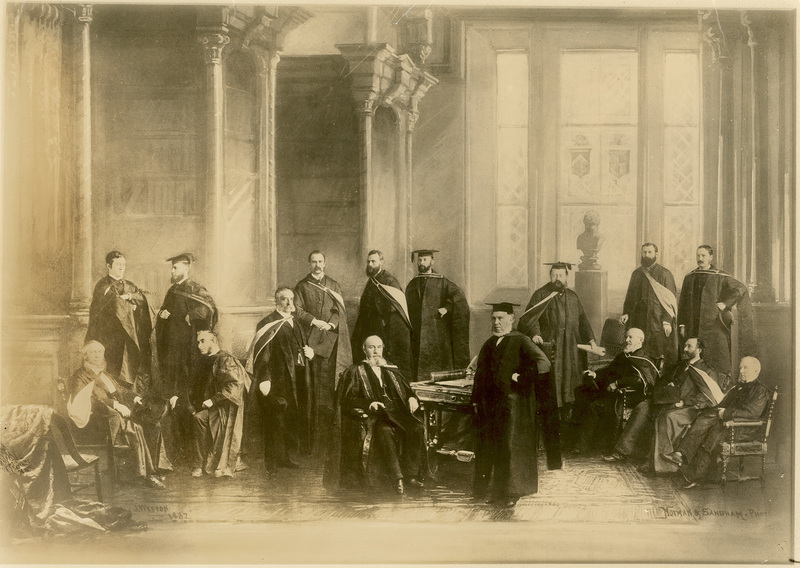 Instructors (listed in alphabetical order): Dr. Buller, Professor Craik, Professor Dawson, Professor Fenwick, Professor Gardner, Professor Godfrey, Professor Howard, Dr. MacDonnell, Professor McCallum, Professor Osler, Professor Roddick, Professor Ross, Professor Scott, Dr. Shepherd, & Professor Wright. Courses (listed in no particular order): Anatomy, Hygiene, Medical Jurisprudence, Ophthalmic Clinic, Botany, Surgery, Practical Chemistry, Pathological Demonstration, Midwifery, Clinical Medicine, Clinical Surgery, Materia Medica, Histological & Physiological Demonstration, Physiology, General Pathology, Practice of Medicine, Chemistry, & Practical Anatomy.